I've noticed this with headphones, and now it is confirmed, as I recorded my stereo out. 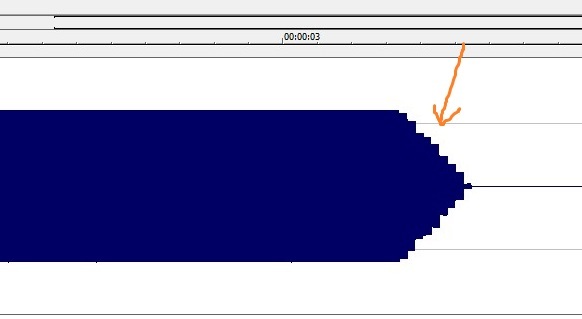 The "width" of the constant pieces is exactly the audio buffer size (1024 samples in my example). How to solve it ? I suspect it comes from /src/mixer.c, which calls Mix_FadeOutGroup(). Tested on both Pygame 1.9 Win7/PC and RaspberryPi. Thank-you for reporting this issue. I can hear the little clicky noises. Unfortunately, the fadeout math is in the SDL mixer code, not pygame. I cannot think of a feasible way to fix this fadeout noise issue in the pygame library because there is no way to determine precisely when the amplitude of the current sound is at zero and decrease the sound's volume at that precise moment.